No matter who occupies the governor’s office in 2019, he will be faced with a $4.6 billion budget deficit, including 7 percent raises for state employees, and increasing costs for unfunded pension and state retirement benefits. At some point, the state of Connecticut’s relationship with its government unions will be put to the test and possibly reevaluated as costs continue to grow. Connecticut’s two major tax increases in 2011 and 2015 went entirely toward pension costs, according to both Gov. Dannel Malloy and Office of Policy and Management Secretary Ben Barnes. Those tax increases helped push certain businesses and residents to move out of state. Connecticut has lost population and its economy has remained one of the slowest in the nation. Clearly, Connecticut faces challenges related to labor and the benefits it provides its workforce. So how did Connecticut get here? Yankee Institute’s study Above The Law: How Government Unions’ Extralegal Privileges are Harming Public Employees, Taxpayers and the State, offers a look how Connecticut’s laws have been uniquely influenced to allow labor unions a few extra “privileges,” which drive up the cost of government. Connecticut is one of only four states which allow retirement benefits to be collectively bargained. Most states allow collective bargaining for salaries, medical benefits, work hours, etc., but most set retirement benefits in state statute. In Connecticut, teacher pensions are set in statute, but state employee retirement benefits are negotiated between government union leaders and the governor. That negotiated agreement can then be ratified by the legislature. This is one of the reasons public-sector unions are so active in elections: they can offer considerable help in getting the candidate of their choice elected for governor or state legislator, which secures them a strong position at the negotiating table when a contract arises. Gov. Malloy negotiated the 2017 SEBAC concessions agreement, and it was passed narrowly in both the House and the Senate. While offering some savings, the agreement also extended Connecticut’s benefit contract until 2027, making it a 30-year deal and tying the hands of the next governor and legislature. Until 2017, union contracts could be passed without a vote by the General Assembly because of a state statute that said any contract not voted on within 30 days was “deemed approved.” Between 1991 and 2017, 124 union contracts were passed into law without a vote in either the House or the Senate. Those contracts dictated wages and benefits for state employees. The statute was finally changed as part of 2017’s budget negotiations. Now, contracts not approved within 30 days are deemed rejected. However, the new law does allow for a workaround through arbitration in which an unelected state arbitrator can actually pass a contract the General Assembly has rejected. (see video below). Union contracts not only guarantee wages and benefits, but they also have the ability to override state law. 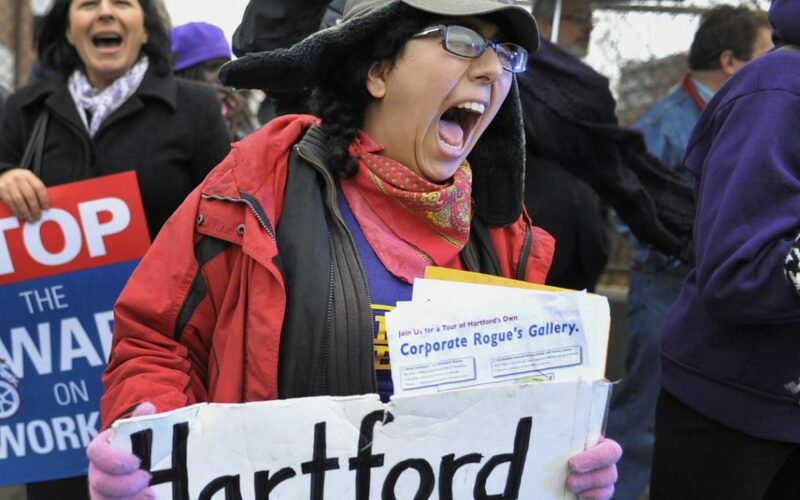 Known as “supersedence,” Connecticut’s labor contracts allow unions to be above the law in some cases. For example, when state auditors found an employee was placed on paid administrative leave for 69 weeks – in violation of the 60-day limit imposed by state statute – the Department of Developmental Services responded the employee’s labor contract superseded state law and allowed for the excessive leave time. More recently, the employment record for a professor at Central Connecticut State University accused of prolonged sexual harassment of female university students is sealed from public disclosure due to the union contract, which supersedes Connecticut’s Freedom of Information laws. Union contracts also guarantee union release time, which allows a state employee to be paid while performing work exclusively for the union, such as meeting with employees to process a grievance or participating in disciplinary hearings. Union release time can also be used to attend union conventions. According to a Yankee Institute study, union business leave cost taxpayers $4.2 million in 2015, with some employees spending almost every workday on union business leave. Labor costs represent the biggest expense in Connecticut’s budget. According to the Office of Fiscal Analysis, employee payroll accounts for $6.2 billion per year, nearly 30 percent of the budget, including $3 billion in fringe benefit costs. Connecticut’s fringe benefit rates are rising dramatically as the state’s unfunded pension liabilities drive up labor costs. While some state employees have gone years without a raise, the added costs of state benefits drove labor costs higher. However, part of Malloy’s 2017 SEBAC concessions agreement included a one-time $2,000 bonus in 2018, followed by two consecutive wage increases of 3.5 percent for the state’s unionized workforce. The raises, combined with increasing pension costs, are driving up tuition at UConn and Connecticut’s state universities and colleges. The agreement also included layoff protections until 2022. No matter who is in charge at the Capitol — or the size of the deficit — Connecticut will not be able to trim the size of its workforce in order bridge the gap. The concessions package was voted on by the legislature, with Lt. Gov. Nancy Wyman the deciding vote in the Senate. And this is why we have a mass exodus from the state; myself included.